The first section of this page gives very brief descriptions of cycling climbs I did, or Tanya and I did on the tandem, in July and August, 2014. We took a road trip to Utah, then Wyoming, back to Utah, finishing in California. All the climbs are from the second edition of John Summerson’s book, The Complete Guide to Climbing (by Bike), and if the climb is in Summerson’s top 100 climbs, I’ve shown Summerson’s rating. 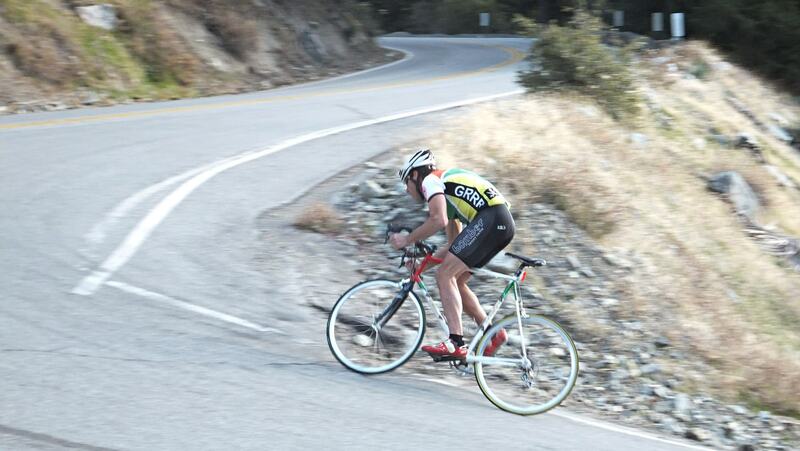 For example, #14 means Summerson rates the climb as the 14th hardest in the U.S. Besides the difficulty ranking, I also show the difficulty number, and the number of feet climbed for each ride. For example, Alternate 14 gets (#27, 3.34, 5,314′). I won’t repeat information Summerson gives in his book, but instead I’m just giving my impressions of the climbs. San Marcos Rd/Painted Cave (2.20, 2,485′) A lovely ride. 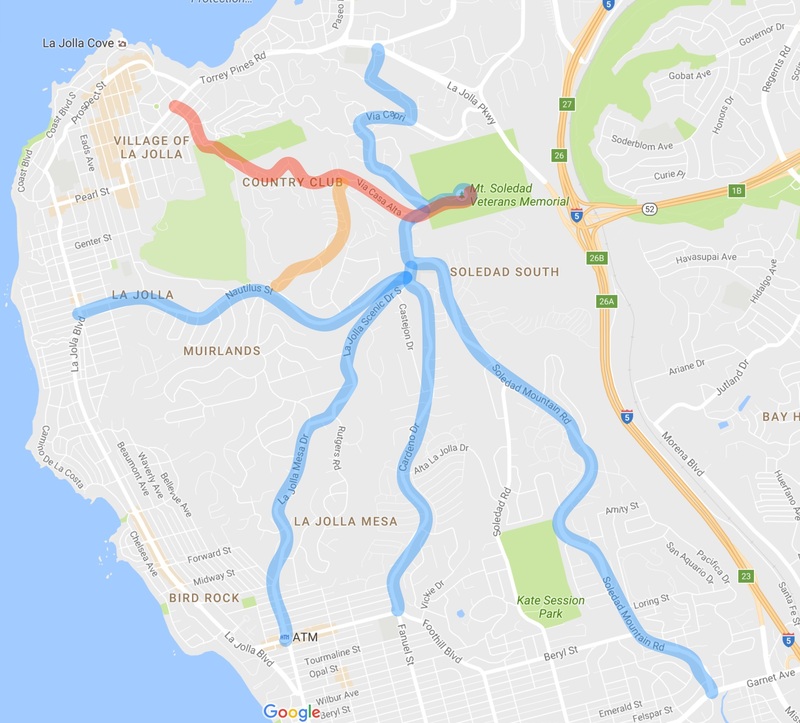 I combined this with Gibraltar Road, going up SanMarcos/Painted Cave, along Camino Cielo (which has beautiful views of the ocean), and down Gibraltar, then turned round and reversed the route. It was the most fun and twisty ride I’d done in a long time. So many turns. The upper (Painted Cave) part has some fantastic steep riding, then finishes along a single-lane road through a lovely wood. Gibraltar Road (#85, 2.40, 3,560′) A fun ride. See above. There’s a section maybe a mile long in the upper part that needs some repair work so be careful coming down that part. Refugio Road (#51, 2.77, 3,857′). A strange ride. Summerson describes it as “a stunning climb” but I wasn’t as impressed. The steep first part of the climb has a very poor road surface in places. After about 5 miles you turn right and follow the ridge on an easier but much better road. Ronald Reagan had a big ranch up Refugio Road, Rancho del Cielo, also known as the Western White House, to which he invited world leaders such as Margaret Thatcher, Queen Elizabath, and Mikhail Gorbachev. I suspect they got there by helicopter rather than along the road. Figueroa Road East (2.29, 3,342′) A great ride, mainly because I rode both sides of Figueroa Mountain. For some reason I couldn’t find the start to the east side so I started up the west side. This is a wonderful climb, very varied and really pretty. I went down the east side, then returned the same way. Strangely, the road surface is really good most of the way, but there’s a one mile dirt section for no apparent reason. The west side was in the first edition of Summerson’s book but has been dropped from the second edition. A shame because while it may be easier than the east side, it’s a lot more fun. 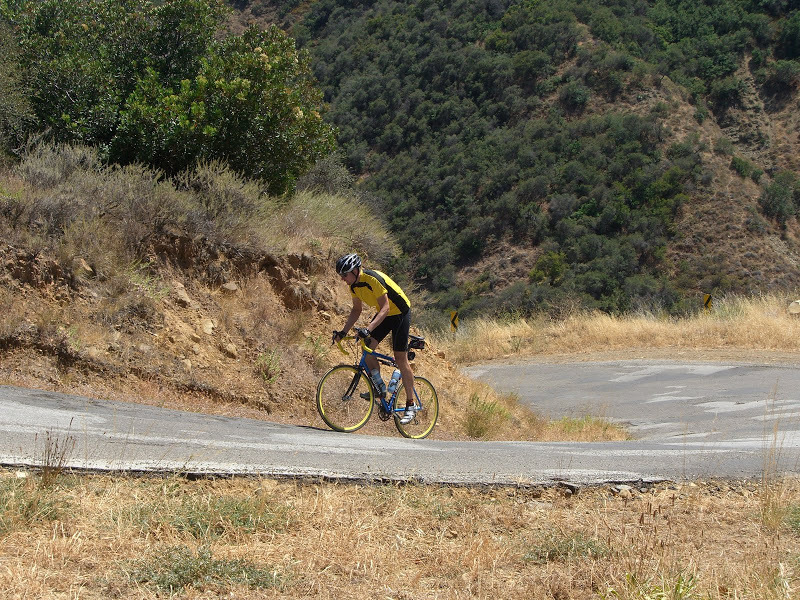 If you do this ride, visit the nearby town of Solvang, a very cutesy Danish -style town. Mt. Baldy (#15, 3.84, 4,830′). Summerson calls this “Perhaps the hardest climb in Southern California, and used in the Tour of California.” I didn’t think much of it. The first two thirds are nothing special, then you get to Mt Baldy Village and the grade steepens. There are a few steep sections but it’s not continuous, and the steepest part is at the end, through a big parking lot. I guess you have to do this as it’s supposedly one of the tough ones, but I didn’t think it was very special. A much better way to do it would be to go up Glendora Mountain Road followed by Glendora Ridge Road to Mt Baldy Village, and then do the hard finish to Mt. Baldy. This route is much prettier and longer, with a gorgeous twisty road winding up and across the hills. 39/Dawson Saddle (#16, 3.81, 6,438′). I loved this ride. It’s big and beautiful and the views are spectacular. Or, as Summerson says, “a massive climb….with excellent views in places along the way.” You can think of it as three parts – the first part, the steepest part, goes up a smooth, winding road to the turnoff for Crystal Lake. Part two is up a closed road that cuts across the hillside and which I had to myself. Part three heads up the Angeles Crest road to Dawson Saddle. Well worth doing, and you might as well add in the short side trip to Crystal Lake. Palomar Mountain (#23, 3.43, 4,735′). Summerson describes this as “one of the most difficult climbs in Southern California.” He also says that “this climb is longer and as steep as the standard route up the Galibier.” So you can knock the Col du Galibier off your list 🙂 A fun ride, the first mile or so from Pauma Valley are pretty steep, then after a few miles you turn off the main road onto South Grade Road. The climb switchbacks steeply up from here, without too much traffic. A long way from the other climbs but worth doing if you are in the area. This section contains rides that we did after 2014. The rides were not so devoted to Summerson climbs and there is generally more description. After our main road trip in 2016 we went back to Tucson for a week then Tanya left to visit family in India. 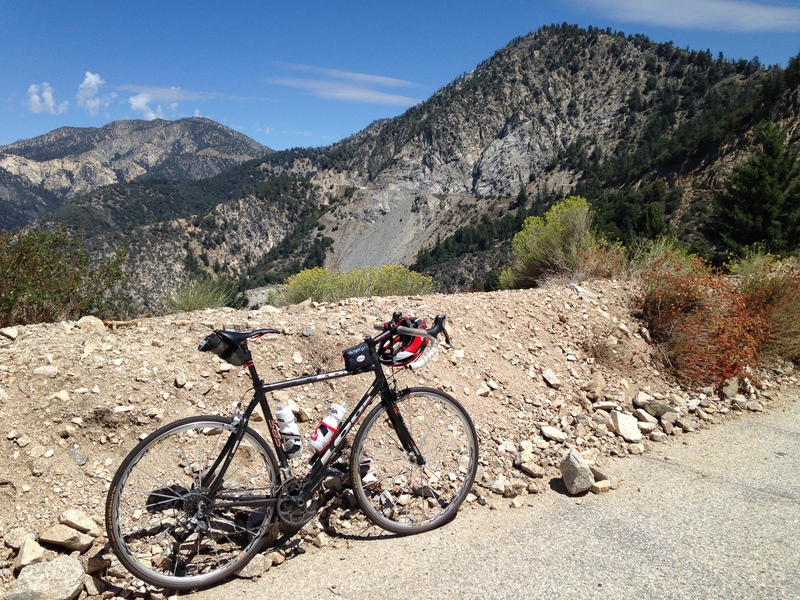 I decided to return to California as I wanted to do some of the big climbs in the Eastern Sierra. Rather than include them in this page, I’ve written a separate page about the Eastern Sierra climbs. Mt Shasta City is a small town on I-5 just south of the Oregon border, nestled under Mt Shasta. 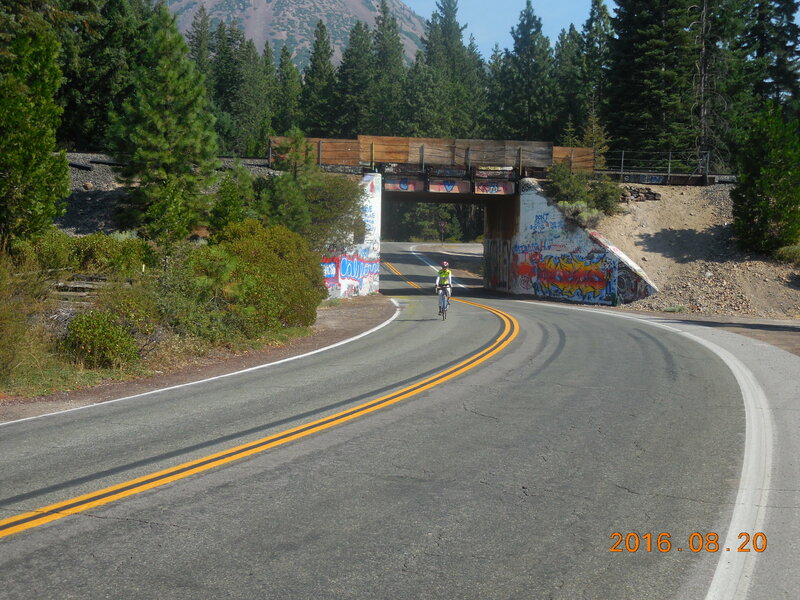 The main ride here is to climb the Everitt Memorial Highway up the flanks of Mt Shasta. 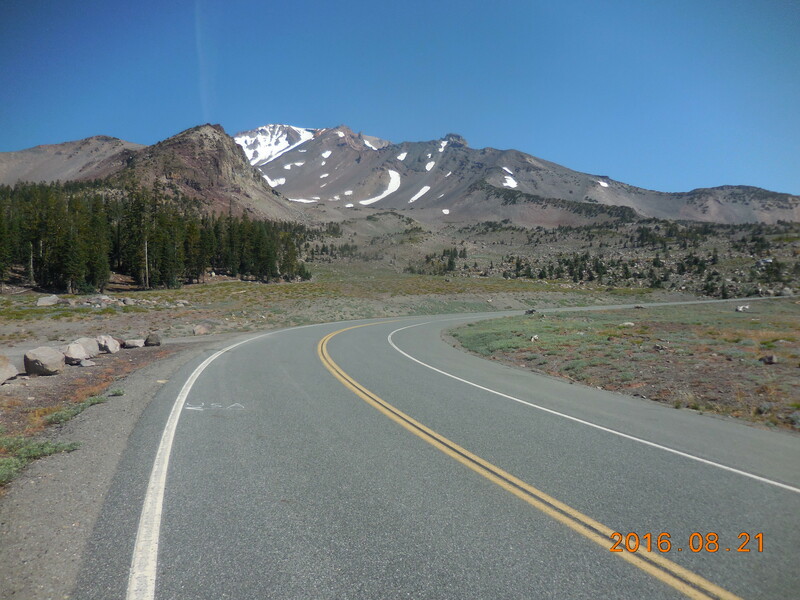 There are other rides in the area: Summerson lists two more hard climbs, there is a good 8 mile climb to Castle Lake, and Cycle Siskiyou lists several rides and has maps of each. You can also pick up a map of the Siskiyou County Bike Routes in the Fifth Season store in Mt Shasta City. This is the big climb in the area, finishing under the rocky, barren slopes of Mt Shasta. It’s about 14.4 miles long with 4,100 feet of climbing. It has a reasonably consistent gradient on a smooth road with a good shoulder, but it’s never very steep. The last couple of miles give you great views of Mt Shasta. You can start anywhere in Mt Shasta City, and I chose to start at the intersection of Lake Street and Mt Shasta Blvd. Ride NE on Lake St then bear left on N Washington Dr. Continue north on this as it becomes Everitt Memorial Highway. Follow this to the end. At mile 14 the composition and color of the road changes and it becomes very cracked for the last 0.4 miles. This is a lovely 26 mile out-and-back along a smooth road with some good rollers and very light traffic. Start at the intersection of Lake Street and Mt Shasta Blvd. Ride down Lake St, across the Interstate, then it becomes Hatchery Ln. At the T-junction, turn right on Old Stage Rd. At the T-junction at mile 3.8 turn left following Old Stage Road. At the 4-way stop at 6.0 miles, continue straight. At the T-junction at 13.3 miles turn around and ride back. From the T-junction at the end, turn left on Old 99 Hwy, ride 0.5 miles, then turn left on Stewart Springs Road, and ride up this gentle climb for 4 miles to the resort. After the lovely smooth Old Stage Road, this road feels very rough. Ride back along Old Stage Road for about 3 miles to College Ave on the left. Turn left and ride College Ave into Weed then ride the Hoy / Edgewood loop. We were told about this by some cyclists we met – they said it was very pretty but the road is not so good in places. On the way back along Old Stage Road, simply explore the many roads that head off to the sides. Mt Diablo is a beautiful climb from either the north or the south. From the south it’s about 11.2 miles and 3,320 feet of climbing. The road twists and turns and the views are wonderful. The northern and southern routes join about 4.5 miles from the top. The final two hundred yards is far and away the steepest section on the climb, reaching a 17% gradient. On this trip we rode Mt Diablo from the south. 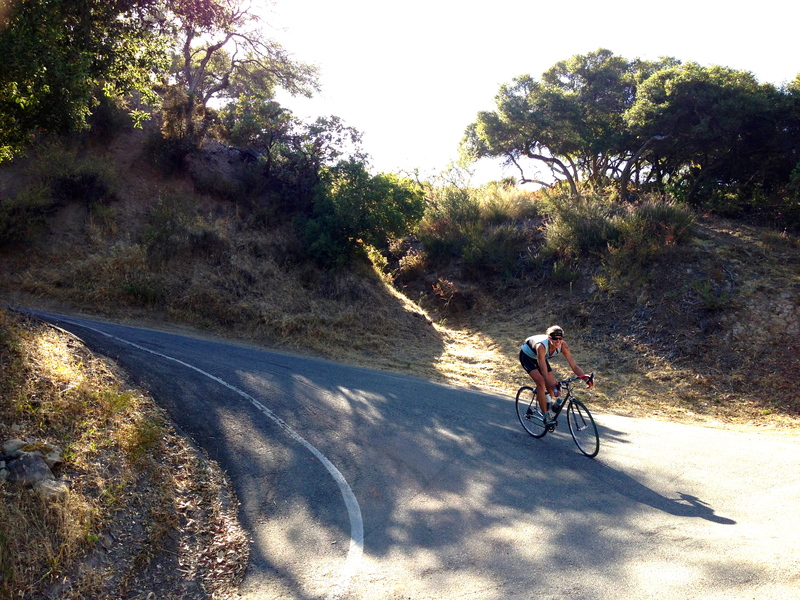 The climb starts at the intersection of Blackhawk Road and Mt Diablo Scenic Blvd. We parked a short way up Blackhawk Road on Diablo Creek Place. This is another of Jay Rawlins’ “Best of the Best” rides. This is a long but good ride with lovely views. The top 6 miles is amazing, with lots of very tight switchbacks. The whole ride, out and back, is 36.8 miles with 4,800 feet of climbing. This popular ride is another of Jay Rawlins’ “Best of the Best” rides. Start at the intersection of Mt Hamilton Road and Alum Rock Ave. You will often see many cars parked here. I saw about 50 cyclists including 5 tandems when I did this ride. The road surface varies between good to rough chip-and-seal to silky smooth. But even the rougher parts are wonderful compared to the roads in Sonoma County. The climb is never too steep, and even includes two long downhills. At about 6 miles you get your first view of the Lick Observatory, which seems to be miles away. At 11 miles, everything changes: you see the observatory rearing up ahead of you, the road goes downhill, and the surface changes to silky smooth. The last 6 miles are wonderful to climb, and even more incredible to descend. This ride is only about 3 miles from the start of Mt Hamilton and I read about it on Jay Rawlins’ site. So after riding Mt Hamilton I drove over there and just rode the uphill, which is 3.65 miles long with 1,805 feet of climbing. It has some brutally steep 18% sections, but fortunately the climb is stepped so the steep parts don’t last too long. Start at the intersection of Sierra Road and Piedmont Road. Ride uphill to the top, to the Sierra Vista Open Space Preserve viewpoint. 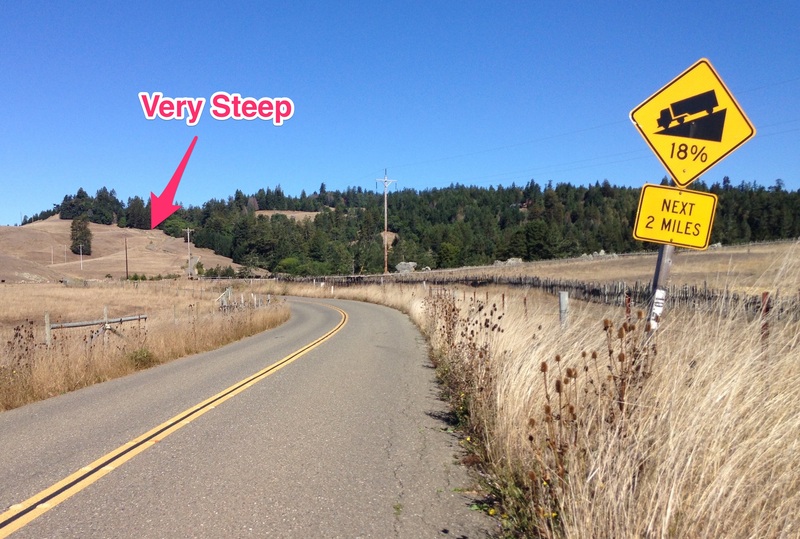 The cycling in Sonoma Country is well known for its short steep hills, and its crappy roads. Not all roads are bad – in fact some of them are super-smooth (and usually have more traffic), but the less-traveled roads are often rough and pot-holed. The riding is okay but not my favorite. The Santa Rosa Bike Club has a web page showing “10 great rides“. There’s also a very good Sonoma County Bike Map that you can order online or buy in bike stores. King Ridge is the only reason I can see to come to this area. It has plenty of rough and potholed road, but it’s a great ride: tough and varied, with lots of very steep climbing and wonderful views on the top of the ridge. 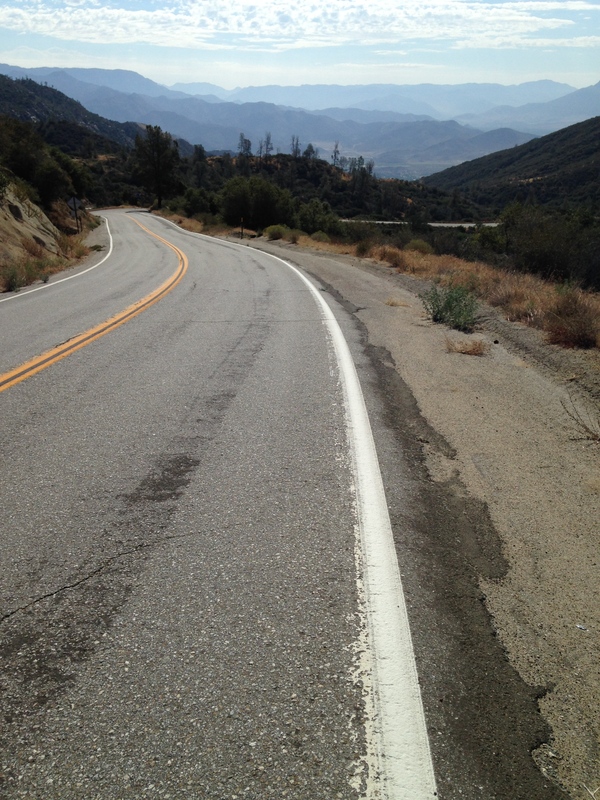 It’s a famous ride: it’s part of Levi Leipheimer’s Gran Fondo and the Amgen Tour of California has raced this road – I can’t imagine going full speed down some of these hills. I don’t particularly like riding through trees, and I especially don’t like riding through trees with dappled sunlight on bad roads. There’s plenty of that on this ride, but for this one ride, it adds to the adventure. I chose to ride it in yet another way (the even better way), with more climbing and less flattish riding. 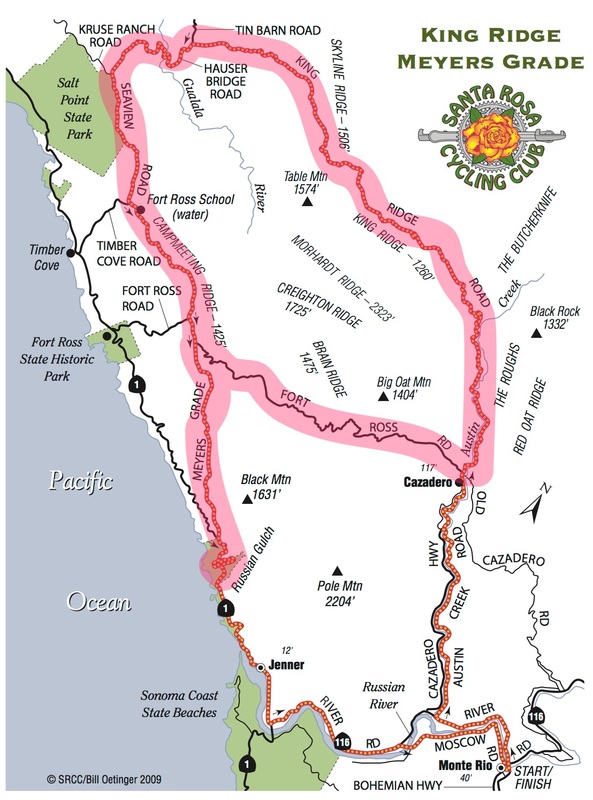 It includes all the climbing on the classic ride, and adds the incredibly steep Meyers Grade Road, and Fort Ross Road. My variant is 49 miles with 7,320 feet of climbing. I saw almost no traffic on most of the loop. Here’s a useful map. At the end of the climbing, at about mile 1.83, turn right onto Meyers Grade Road. This road has some super steep sections where my Garmin showed 20%. Follow King Ridge Road easily at first, then more steeply. The next 16 miles vary a lot, with some steep climbing, some rolling riding, trees, no trees, and beautiful views when you are on the ridge out of the trees. The ridge section is what makes the ride great. At mile 31.7 turn left following the sign for Hauser Bridge. Descend down to the bridge on a better road than some you’ve been on. The bridge is a one lane, metal surfaced bridge. Climb steeply from the bridge then at mile 38.5 you reach an intersection. Continue straight on Seaview Road, following the sign for Cazadero and Jenner. 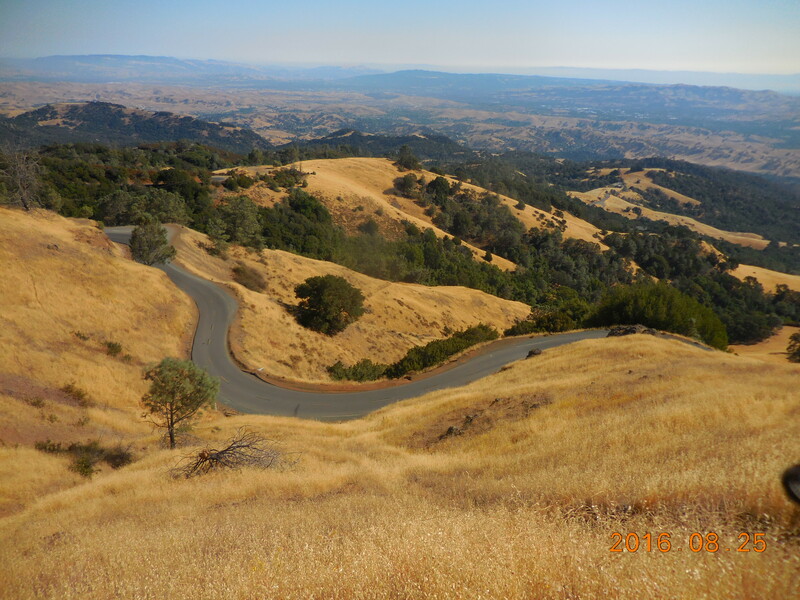 Eventually you’ll descend the very steep section on Meyers Grade Road and reach Hwy 1 at 47.14 miles. Turn left and descend the wonderful big switchbacks back to your car at 49 miles. Starting in Occidental, this loop is 24.7 miles with 3,300 feet of climbing. As with all the riding in this area, the road quality varies considerably, although is never really bad. And the hills, while not long, can be viciously steep. The hardest part of this loop is climbing Joy Road. It’s a wonderful rolling ride with great views and great climbs. Start in Occidental and ride south on Coleman Valley Road, with a steep climb out of town. The road rolls for several miles before a 1.5 mile, 770 foot descent drops you down to the coast and Hwy 1 at about 10 miles. Turn left and follow Hwy 1 for about 2 miles. 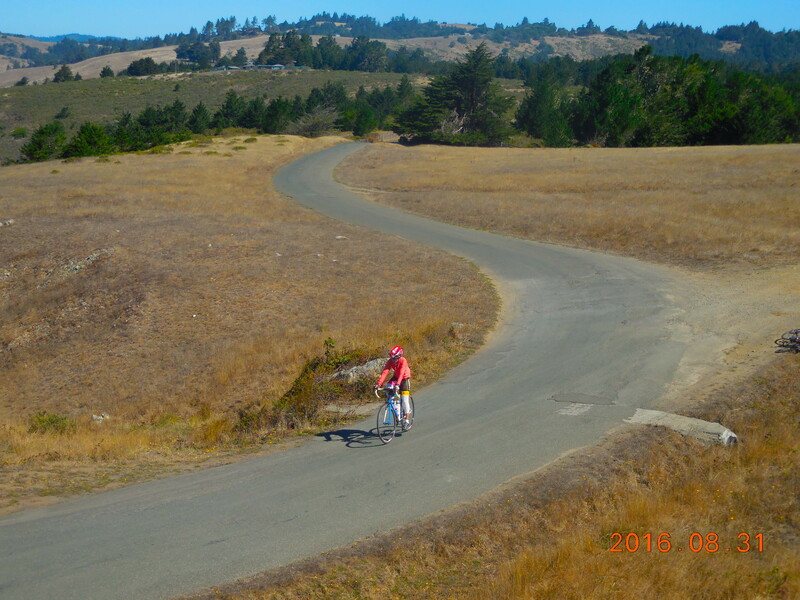 A few hundred yards after the Bodega Bay city limit sign turn left onto Bay Hill Road. Just under 4 miles later, after some good climbing and descending, you rejoin Hwy 1. Turn left and follow this with a reasonable shoulder for 1 mile then turn left at mile 16.85, following signs for Bodega and Sebastapol. You are now on a beautiful road with a lovely shoulder, so follow this through Bodega. A short distance after Bodega, at about mile 18.25, turn left on Joy Road. Climb this with several very steep sections up to Coleman Valley Road. The upper part of Joy Road is an interesting residential area in a redwood forest. Descend the other side of Joy Road to the Stop sign. Continue straight onto Coleman Valley Road and follow this as it climbs then makes a big descent into Occidental. The best rides around Paso Robles are in the wine country to the west. 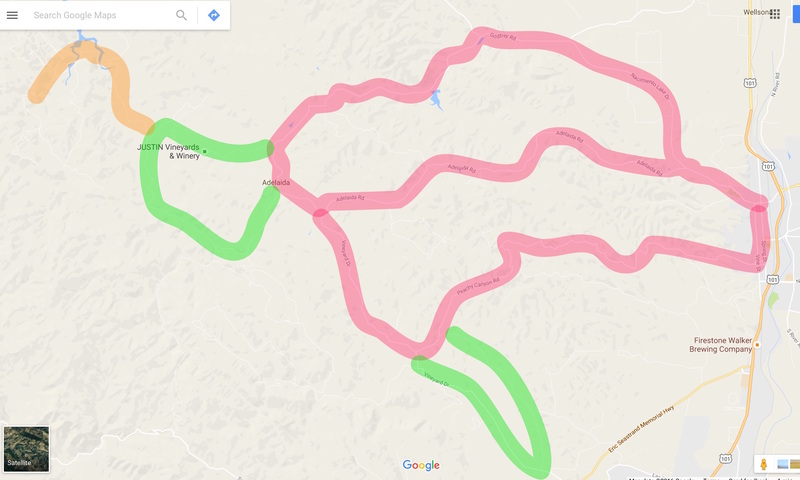 There are three main roads that head west: Nacimiento Lake Drive / Chimney Rock Road, Adelaida Road, Peachy Canyon Road – and you can make a big loop or two smaller loops out of them. Then there are a few add-ons. The riding is all wonderful – rolling and twisting through beautiful hilly wine country. As you ride up and down and around, you pass many vineyards, wineries, and ranches. Of all these great roads, the one that you really have to do is Peachy Canyon as it returns to Paso Robles. This ride is superb and complex on a beautiful road – it’s, well, peachy. It has very little traffic, as do all the roads except Nacimiento Lake Rd. 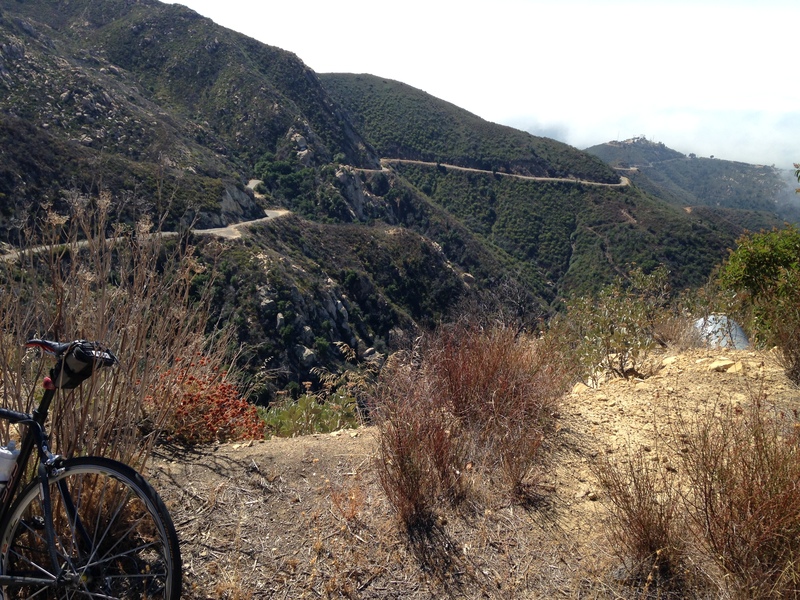 The best shorter ride is to go out Adelaida and come back along Peachy Canyon. This gives you the most climbing on the best roads. Nacimiento Lakes Rd is busy but with a good shoulder. When it turns into Chimney Rock Rd you lose the shoulder and the traffic, and the road surface becomes cracked but still fairly smooth. The worst road surfaces are on part of the Cypress Mountain loop and on most of Willow Creek Rd. A good extension is to continue up Chimney Rock Rd instead of turning left on Cypress Mountain Rd. Rather than trying to describe all the options, I’ll simply point you to a good general description of the area, and to a page that describes all the Peachy Canyon variants. And Jay Rawlins raves about Peachy Canyon as an out-and-back. This ride in La Jolla climbs to the top of Mt Soledad and around the cross at the Veterans Memorial Park six and a half times (the half time being a route that doesn’t go fully to the bottom.) This ride is based on the popular 5 Faces of Soledad climb, which you can find by doing a web search. The ride is a series of out-and-backs from the top and you can obviously start at any of the bottom points. I started at the most northern one as we were staying in La Jolla Shores. 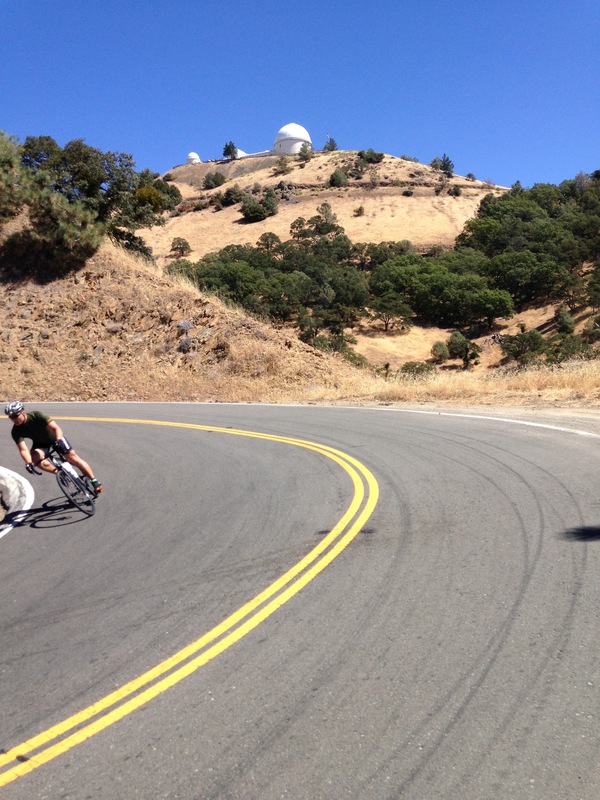 The classic 5 Faces of Soledad is about 25 miles with 3,620 feet of climbing. 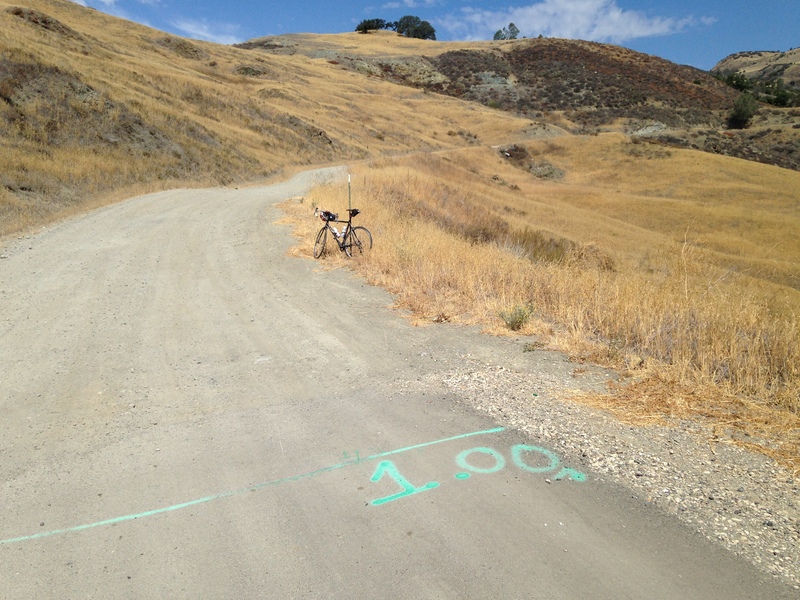 The 6 1/2 Faces of Soledad is about 32 miles with 4,910 feet of climbing. On the image above, the blue lines show the classic 5 faces. The red line is the sixth face I rode, and the orange line is the half face, which only goes down until it joins Nautilus St. There are several other routes you can create if you want more, the most obvious being Hillside Drive. Four of the routes share the last 0.6 miles to the Memorial, so you’ll be repeating part of the ride multiple times. I did the out-and-backs clockwise. Here goes. Start at the intersection of Hidden Valley Rd and Torrey Pines Rd. Ride up Hidden Valley Rd and turn right on Via Capri. The gradient reaches 19% on Via Capri. At the top turn left and ride up to and around the Veterans Memorial cross. This is the shortest and steepest route. Head south on La Jolla Scenic Drive to the first traffic light. Turn left and ride down Soledad Mountain Rd to the bottom at Garnet Ave. Ride back up and around the cross. This is the longest and generally easiest route, although there are three short sections of 8%. Head south on La Jolla Scenic Drive to the second traffic light. Turn left on Cardeno Drive and ride down to Turquoise Street. Ride back up and around the cross. There is a nice section of 8% on this climb. Head south on La Jolla Scenic Drive to the second traffic light. Continue straight down La Jolla Scenic Drive to the T-junction. Turn right then turn left on La Jolla Mesa Drive and continue down to Turquoise Street. Ride back up and around the cross. There is some nice 9-10% near the bottom. Head south on La Jolla Scenic Drive to the second traffic light. Turn right and ride down Nautilus Street to La Jolla Blvd. Ride back up and around the cross. The road above Muirlands Drive is beautifully paved and a delight to ride, and has a nice 8-9% section. You have now done the classic 5 Faces of Soledad. This is the half face. Head down La Jolla Scenic Drive for a very short way then at the red and white radio towers, turn right on Via Casa Alta. After a gentle climb, descend very steeply to Upper Hillside. Turn left and head down Caminito Valverde and Via Valverde to Nautilus Street. (I love that this road is called Valverde after one of my cycling heroes 🙂 ) Ride back up and around the cross. Valverde has some sections of 14% and Via Casa Alta has some 15%. Head down La Jolla Scenic Drive for a very short way then at the red and white radio towers, turn right on Via Casa Alta. After a gentle climb, descend very steeply to Upper Hillside. Facing you is a gate with the sign 7242 Encilia. At the left side of the big gate is a small gate for pedestrians and cyclists. Go through this, ride down the private road, and find the the small gate at the left side of the lower big gate. Ride down Upper Hillside Drive, Encilia Drive, Brodiaea Way, Romero Drive, Country Club Drive, Exchange Place to Torrey Pines Rd. Ride back up and around the cross. There are several steep sections, including 14% on Brodiaea Way and 15% on Via Casa Alta. Descend back down Via Capri and Hidden Valley Road. A very popular loop in eastern San Diego County, this is a wonderful ride, varied and interesting, with ever changing scenery. The loop is usually ridden clockwise. The route is mainly obvious, but there are a few places where it helps to know what to do. At 41.7 miles with 3,638 feet of climbing, the Great Western Loop basically rolls uphill for the first half and rolls downhill for the second half. Park in the shopping center by the intersection of Jamacha Road and Willow Glen Drive. The distances shown here start at this intersection. They are mainly based on Google maps because this area has strange magical qualities: after about 30 miles my Garmin 500 suddenly started showing that I had ridden 557 miles. 5.0 miles, turn right on Dehesa Road. 8.3 miles, at the 3-way stop, turn right to stay on Dehesa Road. 13.1 miles, turn right on Japatul Road. This next section is delicious – mainly uphill, lovely scenery, and you can see the road winding and climbing ahead of you. 20.1 miles, turn right on Lyons Valley Road, and start heading downhill. This next section feels remote, and is spectacular, with lovely views of hills covered with rocks. 27.8 miles, at the intersection with Skyline TT continue straight. The next section is narrower and twistier. 29.5 miles, you start a steep twisty downhill section that ends up in a beautiful rock filled valley. But all good downhills end, and you are faced with a brutally steep little hill to exit. 33.6 miles, turn left at stop sign. 34.2 miles, start another lovely twisty downhill. 37.3 miles, turn right on Jamul Drive. Pay attention or you’ll miss the turn. 40.4 miles, turn right on Steele Canyon Road. 40.9 miles, turn left on Willow Glen Drive. 41.7 miles, back to Jamacha Road and the finish. Note: if you need water on the route, turn left at mile 13.1 on Tavern Road and ride up for 0.5 miles. At the first house on the right there’s a triangle garden with a tap in the middle of the triangle. At mile 29.1 you’ll find the Lyons Valley Trading Post. This is a popular ride from La Jolla, heading north through Torrey Pines and UCSD, to Del Mar and back. You can go further but it gets less interesting beyond Del Mar. As described, it’s a 17.6 mile roundtrip, with 1,240 feet of climbing. Start at the intersection of Torrey Pines Road and La Jolla Shores Drive. Ride north on La Jolla Shores Drive, climbing up through two switchbacks past the Scripps Institute of Oceanography. At the traffic light, turn left on Torrey Pines Road and follow this to a second traffic light. 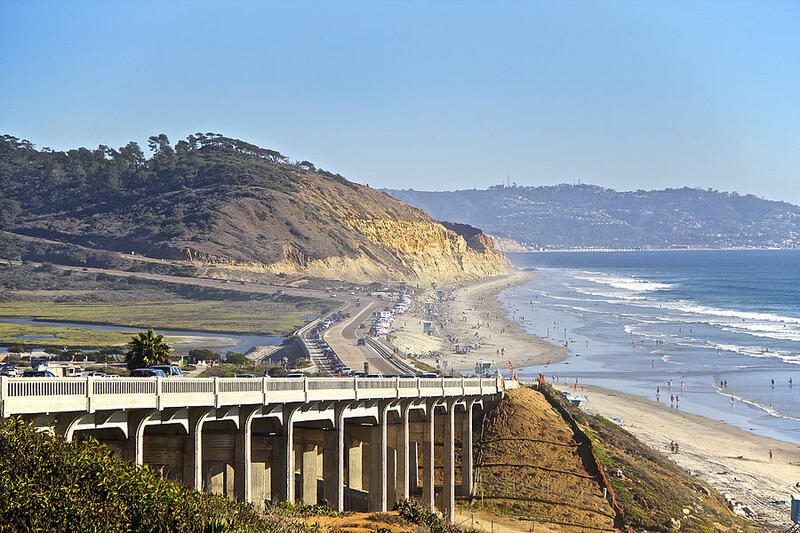 Turn left again and follow Torrey Pines Road to a beautiful, long downhill. At the bottom of this you pass the lovely Torrey Pines State Beach before another climb takes up and over to Del Mar. Ride through Del Mar until you get bored and decide to turn back. Riding back, you climb the wonderful hill out of the State Beach. Never too steep, this is a great hill to power up; some cyclists use it to ride hill repeats. 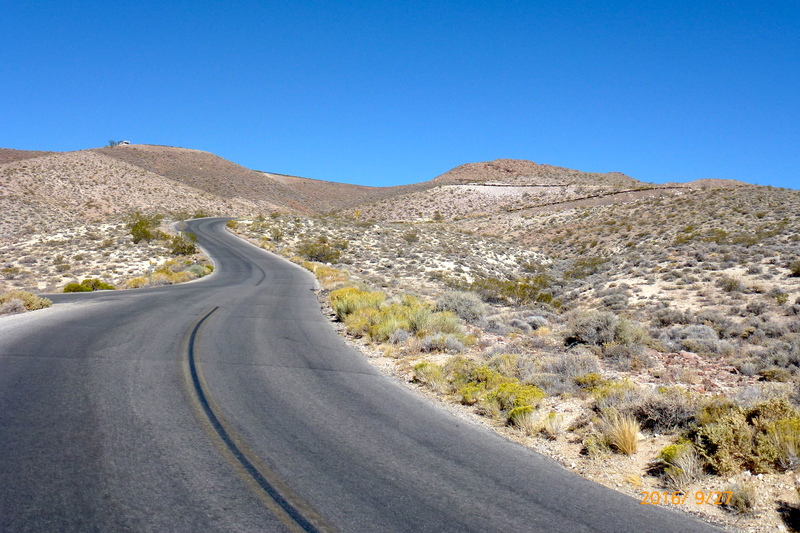 The east side of Townes Pass is a big climb out of Death Valley; it’s also a strange one. The road has so many straight sections and there’s so little change in the scenery, that you wonder why bother? I suppose because you are passing through Death Valley and it’s a big climb. Personally I preferred the west side of Townes Pass, which is more twisty and interesting – and shorter. The east side climb is 14.5 miles with 4,723 feet of climbing. I was coming over from Lone Pine so I simply parked in the Brake Check area at the top of the pass and rode down 14.5 miles to where the road flattens, just before it climbs slightly. 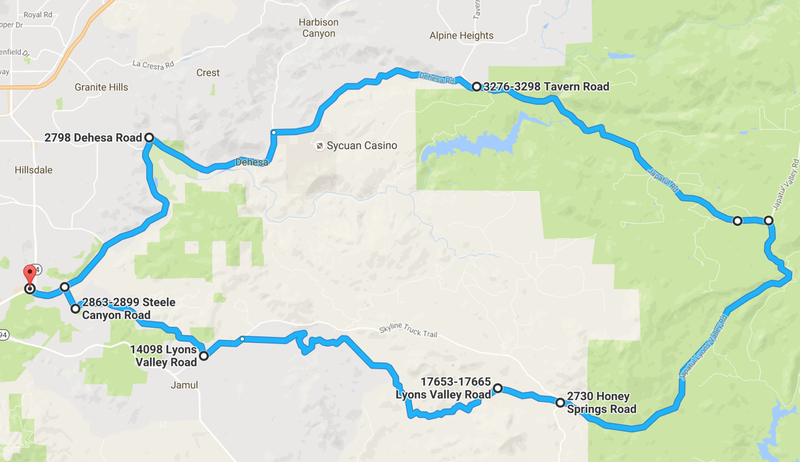 Otherwise you are probably best off parking at Stovepipe Wells (lots of parking) and riding 2.2 miles to the dip in the road where the climb starts. The ride down seemed endless and I wondered how I could possible ride up that whole distance. Well, it wasn’t so bad, although it is a bit monotonous with all the straightaways and lack of changing scenery. So here goes: The climb starts gradually and the tedium is relieved briefly at mile 3 with a short downhill. At mile 6.9 there is drinking water and toilets. There is a lot of riding at 6-7% then at mile 9.5 you get some 8%, which increases to 9-10% at about mile 10.8. The last 3 miles or so feel different, with the road wiggling a bit through the hills to the top. Dante’s View is a long, boring climb in Death Valley, with a great finish and stunning views from the top. The climb is 25.1 miles and 5,666 feet of climbing. 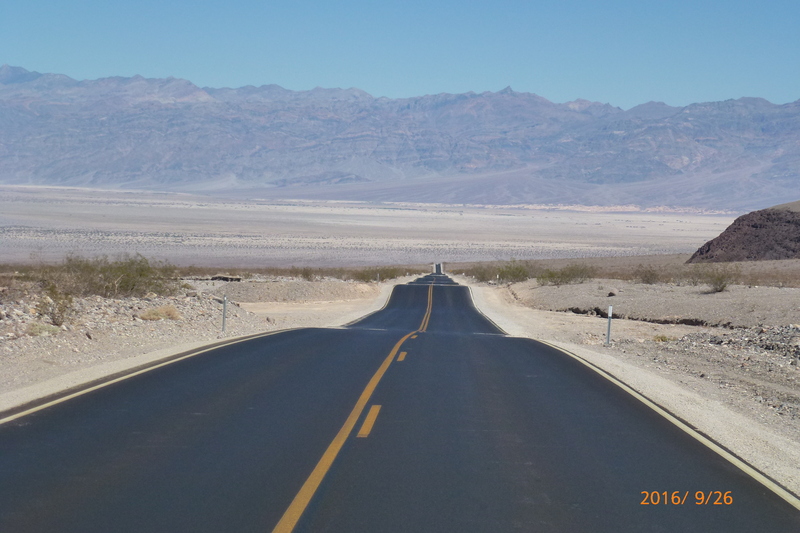 Start at the Furnace Creek Visitor Center (190 feet below sea level) and ride east along Hwy 190 for 12 miles. The gradient is generally very moderate, and if you start early to beat the heat you will have the sun in your eyes the whole way, which rather takes away from the strange Death Valley scenery. After 12 miles, turn right following signs for Dante’s View. Follow this road easily then at about 19 miles it opens into a big bowl surrounded by hills. The gradient increases to 6-7%, then with about 2 miles to go you get some 11-12%. Finally you reach what looks like the top, only to look up and right and see the real top, with switchbacks leading up to it. Starting this section is the steepest pitch on the climb, at 15%. At the very top you have stunning views of the Badwater valley below. I came across a wonderful web site that describes what the author considers the best rides in California and Oregon.